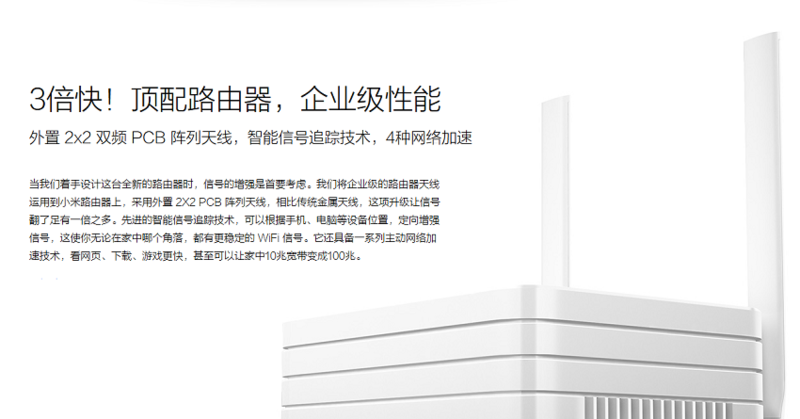 Xiaomi provide updated ultrafast router Mi Wi-Fi with the storage of 1 TB and data transfer rates of 115 megabits per second. Very classy and colorful design. The device is designed as a five-section of white box with two external antennas. When we have started designing an updated router, our top priority was to strengthen the signal. Therefore, for our Mi router we used upscale external dual-band metal antennas PCB 2x2 that compared to regular antennas, amplifies the signal by more than 2 times. Advanced smart technology for tracking signal. This gives you an opportunity to enjoy a stable WiFi signal from every corner of your apartment on your computer, phone, etc. Router also has a number of technologies for active network acceleration, web browsing, downloads, games and even increases speed of your home network from 10MB to 100MB. Download big HD movie on the router using phone. Looking for a source to download HD movie? Now you have a perfect opportunity - in the search bar of your Router APP on your phone, enter name of the film, click download, and your home router will automatically start downloading it. In the evening, when returning home, you can watch right away movie on a TV or phone. Built-in iQIYI, Thunder and other official sources of HD movies. Now it is very easy to check out the latest trends of American TV series or movies. 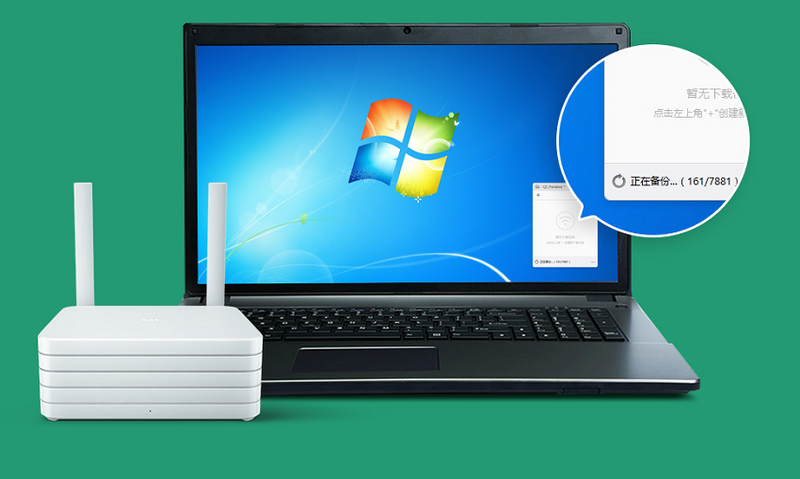 Using Mi router is equivalent to portable hard drive added to your laptop or phone. This is not only helps you, when traveling to store all your photos, music and documents in one place, but even more cool is that at any time in any place you can remotely view all files. Files speed ​​reading 58MB/s, data transfer rate 115MB/s. 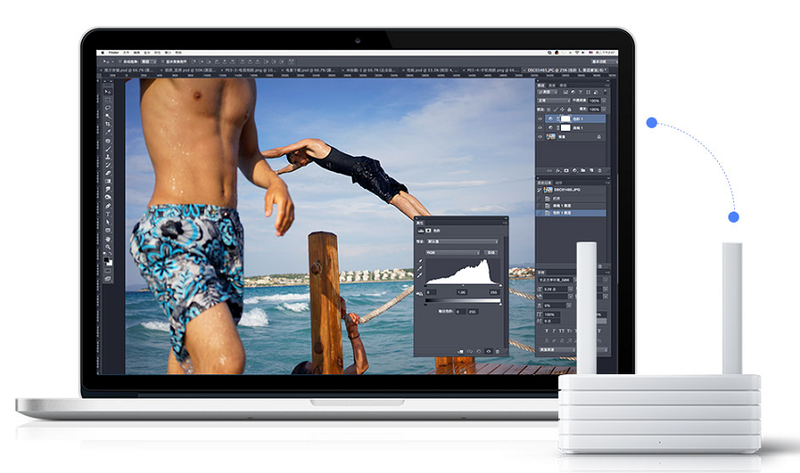 If you love taking pictures, then you'll love the backup function on Mi router. If you have got more than a thousand photos made after your journey, no need to wait a long time until all files are copied, you need only connect the camera to a router, and all images will be automatically imported to the router. Saving your photos to Mi router means that you will be with them inseparable. Even while abroad at a meeting with a friend, with Mi router you can freely show your bright pictures. Mi router is not only a good signal, but it can also speed up an existing network. Function for acceleration of web pages, providing possible options of web pages and its faster load, and even faster web browsing. Availability of Thunder resource, high-speed download. 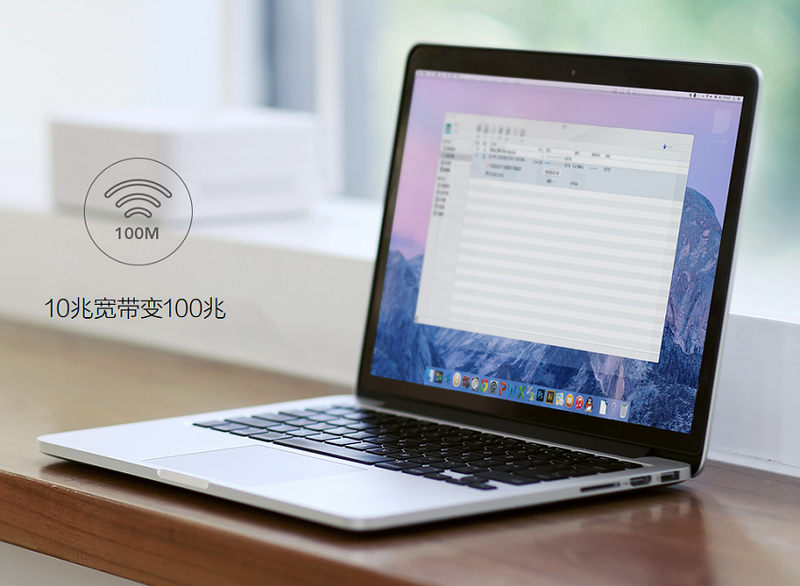 In order to solve the problem of network connection speed, broadband acceleration function is available, home network acceleration in 10 times. 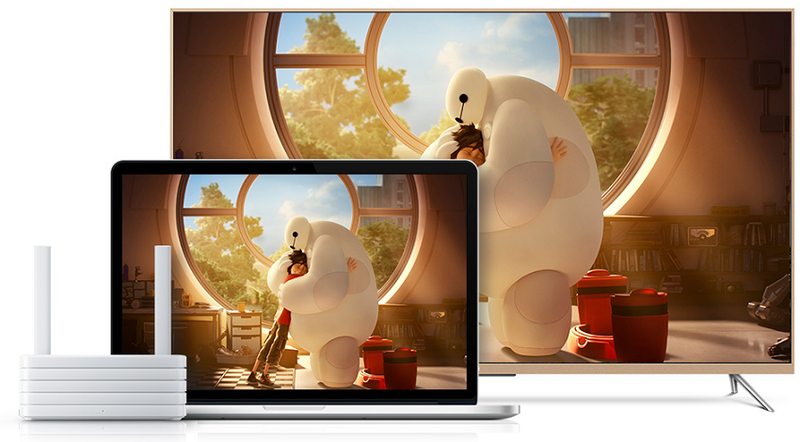 Thanks to multiple network acceleration, you can faster than usually view online videos or download movies. Martial Arts, only speed - no slowdowns, the same principle is in online games. The advantage of acceleration technology is that while you are playing game, and downloading or watching movie, smart technology bandwidth distribution allocates a separate lane for the game to prevent it from breaking. If you need to update your game, Mi router will conveniently download the service pack. Enter in the game and play immediately, there is no more need for a long time to complete an update. Smart router works just as the computer - easy solution to complex problems. Using first-class dual-core processor Broadcom 4709C, 1,4 GHz, Mi router performance increases by 40% compared to technologies of the last century. Fast internet, downloading, and other features also work much faster. We have created a new corporate –class Mi router, which not only has a PCB antennas of corporate -class, dual-core 1.4GHz Broadcom processor, high-quality internal storage, but also has smart technology tracking signal. All these components provide you with the best signal, more reliable, high-speed. That is why Mi router became the best model among home routers. Design solution of the router is very good for a stable signal Mi router, we used a PCB antenna which consists of a circuit board and four "antenna elements" design accuracy reaches 0.02 mm, as compared with average metal antennas more than 10 times again! PCB antenna amplifies the signal much better of two frequencies, as compared to average antennas: 2.4GHz magnification to 4dBi and 6dBi for 5GHz. This strong and stable signal gives you the opportunity to enjoy high-speed WiFi internet, using any device. At a weak signal frequency of 2.4GHz, signal acceleration is possible on 100%, if at a frequency of 5 GHz - signal acceleration on 30%. PCB antenna, ellipsoidal form of a wireless signal data transfer rate higher and more stable transmission of data in case of emergency. Normal antenna can just evenly distribute your WiFi signal throughout the room. Smart signal tracking technology, which has the Mi router, making it the leader among the other routers. It is based on technology Beamforming and can determine the location of devices connected to WiFi 802.00as and focus its signal in the right direction. Thus, you get a more stable and powerful WiFi signal on your phone, tablet, and other devices. With built-in 4 autonomous microchips, Mi router can significantly accelerate the output. The router also has three modes of signal transmission, for more convenient use at home: for example, the mode signal acceleration (through walls) - a powerful WiFi signal through a complex structures of your house / apartment. Support for new high-speed standard Gigabit WiFi 802.11ac, increases data rate for 3 times. Wireless signal more stable, clean, and the maximum wireless speed of up to 1167Mbps. Simultaneous transmission of data on both frequencies - 2GHz and 5GHz, allowing your phone, tablet, TV and other devices operate at optimal frequency. 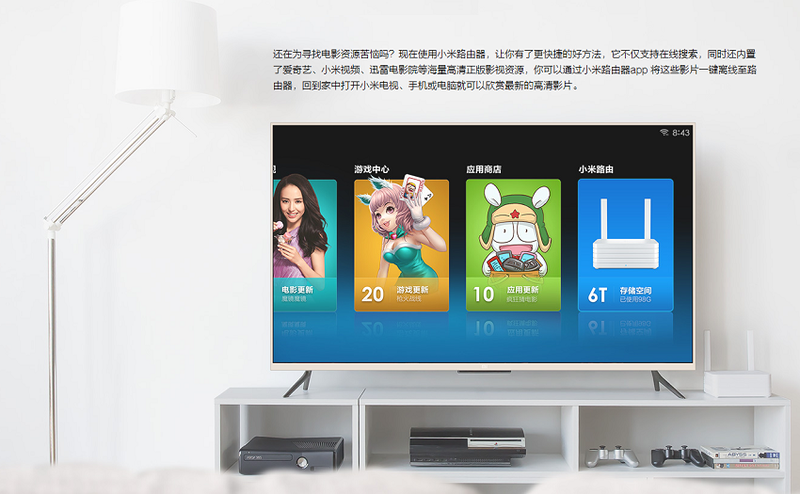 Therefore, no matter you are watching HD movies online, browsing the Web page, or playing online games, you will be accompanied by a stable and high-quality signal. Smart Router should solve fairly complex tasks, so the properties and characteristics of the processor are essential. Mi router has a first-class dual-core Broadcom 4709C, 1,4 GHz WiFi with an increase in productivity by 40%. 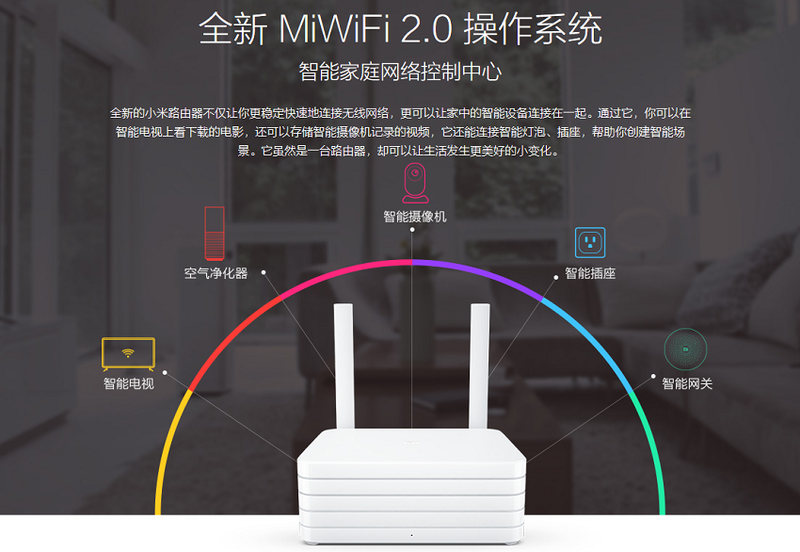 After optimization of characteristics, many devices can be simultaneously connected to the router and browse the web, watch movies online or download files. This router provides high performance data, and accordingly, all your operations are done quickly and without a glitch. Mi router can also act as a server to store personal data, but preservation of the stability and speed of information is very important. Therefore, for Mi router we used hard-drive from companies Seagate Technology / Toshiba. Despite the fact that the cost of the hard drive is much higher in comparison with a conventional PC hard drive, but its reliability and stability even not served by any comparisons. Speed ​​cable data transfer reaches 115Mb / s for transmission 40GB Blu-Ray movie all you need only 6 minutes. Router works – 7x24h, trouble-free operation of about 1.2 million hours. Such stability and security helps to ensure that you can not hesitate to save your photos, movies or documents. For optimal performance of the router very important conditions in which it is located. To protect the network from external signal interference, we have equipped the new Mi router 10 protectors. In addition to the stable operation of the router, we are based on the laws of aerodynamics, equipped it with a plate radiator and fan for better cooling of the router. In addition, the presence of the fan does not increase the noise level - it is only 28 dB, and this despite the fact that the normal noise level at night is 10 ~ 20 decibel. Therefore, you are unlikely to feel any discomfort from the operation of the cooling system. 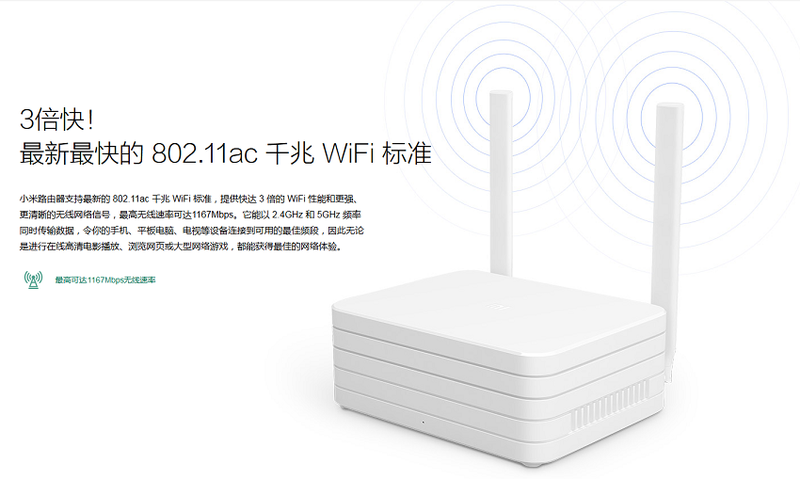 Any device that supports WiFi, can be used in conjunction with Mi router, because it supports the protocols 802.11a / B / G / N and 802.11ac and other major protocols. 1 WAN port (1GB) and a three-port LAN (1GB) that makes possible the rapid cable connection to a desktop or notebook computer. The USB port can also connect a portable hard drive or other device. The Mi router has wireless portable hard drive with a storage capacity 6TB, so you can save all your photos, documents, movies and music. It can read and edit documents, and it is much more convenient than traditional portable hard drives that connect through the USB port. Wireless transmission speeds up to 58Mb / s, which is 2 times faster compared to conventional portable hard drive USB 2.0. In addition, being away from home, you will have remote access to your files via the phone or tablet. You do not like the fact that your laptop size of memory is short? Do not worry! Mi router is equipped with a portable hard drive 6TB on which you can store all your files. You only need to connect your laptop to the Mi router wirelessly, and you can view the data of portable hard drive as simple as the data on the laptop. House data rate can reach 58Mb / s, and even the speed of remote access to data that is higher than their conventional hard drives connected via USB 2.0. Now you can lie on the bed or sit on the couch and enjoy fast and stable WiFi. Exclusion of any risks in the event of valuable data or materials. Therefore, the router is equipped with Mi hard drive from Seagate Technology companies and TOSHIBA, data processing 7x24h - continuous operation of about 1.2 million hours. Reliability and stability compared to conventional PC hard drives. Thus, you can make backups of all of your router important documents, pictures, etc., and be sure of their safety. but the version 6TB at the present time is the hard drive with the largest amount of memory, which can save up all your data: photos, music and movies. For people who love to take pictures a lot, Mi router with built-in hard disk 6TB is an excellent opportunity to store all photos in one place and also have access to them at any time and anywhere. Connect the camera to a router, and immediately and automatically import photos, while avoiding the possibility of duplication. After that you will be able to view photos via a smartphone, a computer, a TV and other devices, in fact you will have remote access to these files. Built-in hard disk of the router is the ideal place to store your images and compared with a computer or a portable hard drive is more reliable. Mi router supports automatic backup of data not only from the camera, but also can copy your data from Android smartphones and iPhone. To turn on automatic backup of data, you must connect the device to the WiFi network. In the case of smartphone update or accidental deletion of important data, you can always restore them. Simultaneously Mi router supports automatic backup camera Yi Camera and other Smart devices. We all love spontaneous travel and more we like to share experiences and photos with friends. But you now have a great opportunity to save all your photos and videos from travels to Mi router, and when all of your friends get together, you can show them your pictures via smartphone or other device. Its use is very simple, browse pictures as quickly and easily as well as those that are in the memory of your smartphone. Now, all your photos are always with you. Do you have difficulties in finding resources to download movies? 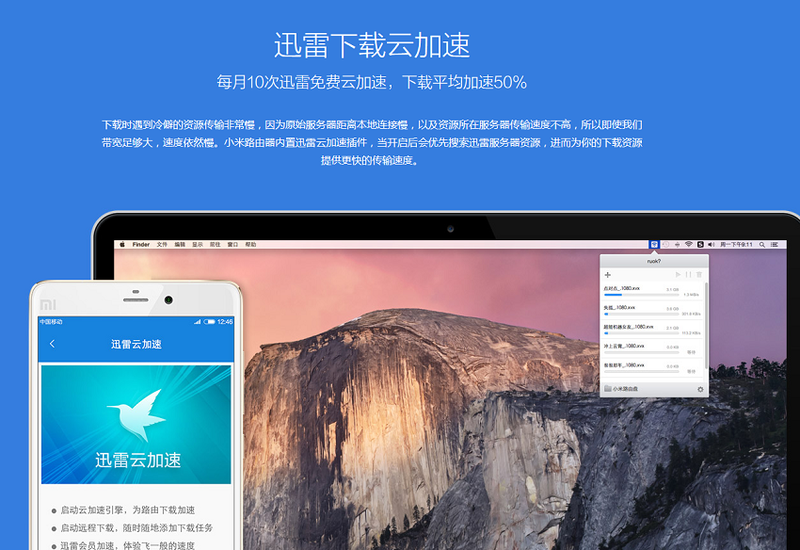 Now,with Mi router, everything became much easier and faster. 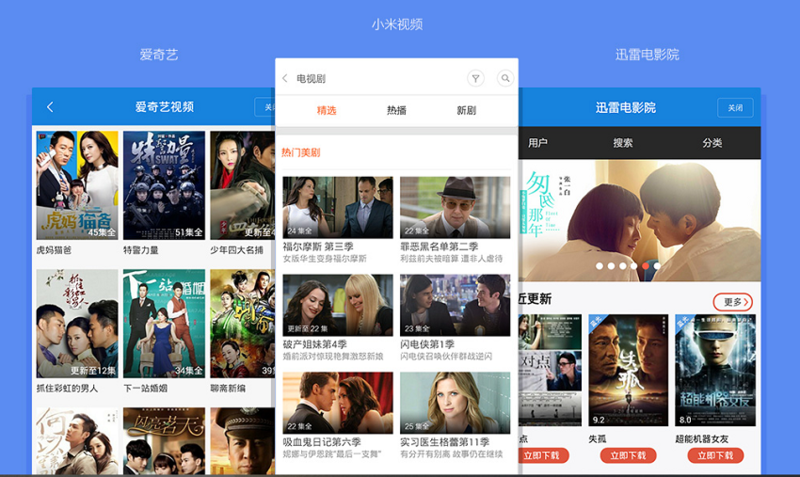 It’s not only supports online search and have access to movie resources, such as: iQIYI, Xiaomi Video, Thunder and other official sources of high resolution movies. Thanks to a special application Mi router, even when not at home, after a single button press, you can download movies very quickly. And coming home, you can view them on your phone, your TV or laptop. At lunch on the job you have heard colleagues talk about an interesting film «Flash», but you can download it on when back home? Mi router will save you from this problem. Now you only need is to enter the application Mi router on your smartphone and touch of a button to start the process of downloading the movie. Mi router will automatically start downloading a movie and you when come home you will immediately be able to view it on your smartphone, tablet or computer. 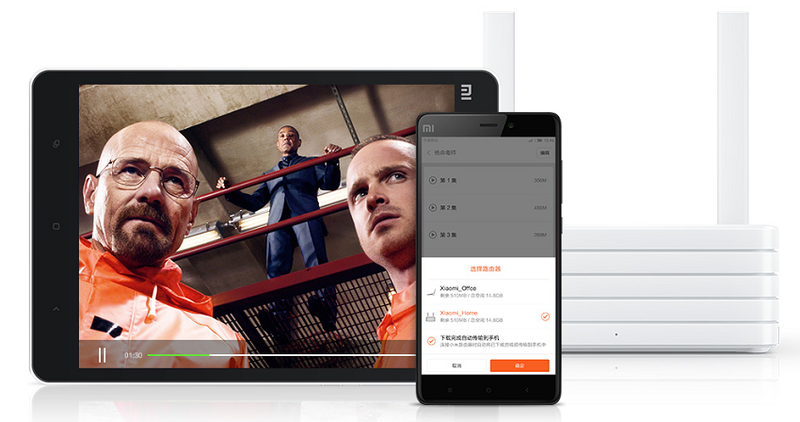 Thanks to Mi router you have not only access to RSPs films resources, such as iQIYI, Xiaomi Video and Thunder, besides it makes the process of downloading very convenient and easy. 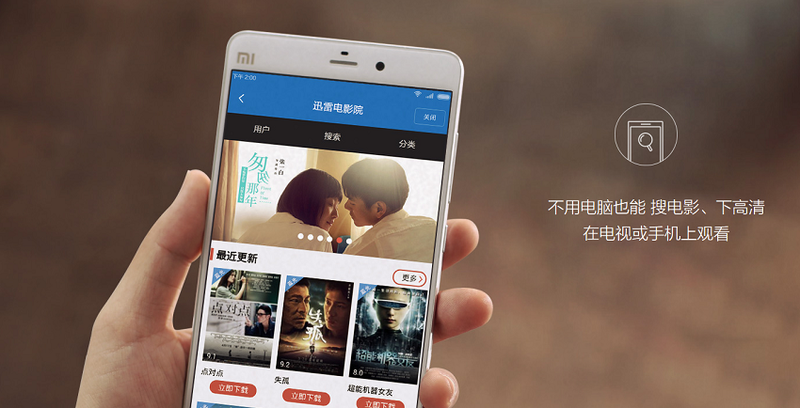 You only need to enter the application Mi router and one click to start the process of downloading the movie. The amount of memory in the router 6TB allows you to store up to 6000 series of high-definition TV shows. The automatic synchronization of films on your phone or tablet will provide an opportunity for all family members to view content that is stored in the memory of the router. For example, when you need to leave the house to while away the time on the road, no longer need to perform a complicated procedure pairing your phone with your computer, you only need to connect your smartphone to WiFi router for 30 seconds and continue to watch your favorite TV series. Sharing good movie with your friends is even easier. Share with other information about you recently downloaded movie via Weibo (Chinese micro-blogging service), WeChat or other microblogging. If he is interested, then he has a chance at the touch to start downloading on the router. Thus, you can mutually enjoy exchanging resources of quality films. People never slow down the speed, Mi router too. It not only can improve the speed of the network, but also speeds up the most frequently used applications. The router provides 4 types of acceleration: the acceleration of the network, the acceleration of Web pages, games acceleration and acceleration of downloads. Even more attractive is the fact that thanks to the acceleration of network bandwidth on your network increases 10 times, a significant increase in network speed. Now you can quickly and easily download files, watch online movies, and perform other tasks. Make a decisive hit at the time, as your friend downloads Korean drama. After the priority network acceleration for games you no longer need to worry about the possibility of braking the network while downloading or watching a movie. If you're downloading a file with a little-known resource, the data rate of the source and the server is very low, and your bandwidth is high, the data rate will continue to be very low. Built in router module Mi acceleration Thunder help solved this problem. You only need to open up and find a resource in the server Thunder and thereby increase the speed of data transfer for your download. New Mi router not only makes your wireless network more stable and fast, but also can control Smart devices in your home. Thanks to it, you can view the downloaded movie on Smart TV, keep the videos on Smart camera, and can even control your Smart lights and rosette. While this is just a router, but it will help you to create a well-functioning Smart in your house. 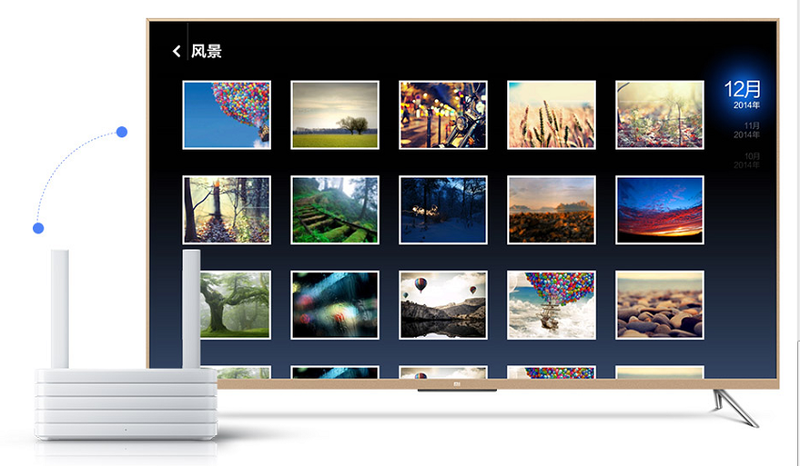 Mi router can provide your hard disk 6TB, as a reliable place to store all the pictures taken on the Smart camera. After connecting the camera to a router, automatically starts up the data on its hard drive to which you have at any time in any place would have access. Mi router - is your music "store"! Any song that would not come to mind, you can listen to it on your smartphone, Mi Box, tablet, TV! Mi router also supports home DLNA media servers, and Samba. Automatic locking Trojans, phishing sites and viruses. With this function, you can put restrictions on access to certain sites for children to create a healthy online environment. At any time, anywhere via the telephone or through a computer device connected to your network, limit the access of external devices at the touch of a button. Availability function for automatic connection of obstruction of unknown devices. Upon notification of suspicious connections, you can disconnect the "uninvited guest" at the touch of a button. Automatic filtering of unwanted advert. Protected user can enjoy "clean" sites.